As it is not possible to tell the BCR how and where to include the MIDI channel number within the SysEx message, the byte containing the channel number must be hardcoded within the SysEx file. Refer to the ReplaceMIDIChannel_README textfile in the package for a search-replace string to change the MIDI channel to your needs. You may use the content of the packages for your own purposes. For distribution, please link to this site. This entry was posted in Behringer BCR2000, Gear and tagged MIDI controller, System Exclusive on 2013/03/02 by MacroDX. The BCR2000 Templates document that you can find on the official downloads page contains simple overlays for control labelling. But I was looking for a way to create enhanced overlays that visualize the device being controlled rather than just labelling the controls. SkinMan is a freeware program for creating skins for audio plugins. I created templates for the upper and the lower sections of the BCR. SkinMan can be found here. Download the SkinMan templates here. Background: The overall background of the overlay. Cutouts: These should be left as they are, blank sections to be cut out of the printed layout. They represent the actual buttons and encoders on the device. Labels: Editable primitives for the label background. Label text: The text fields for each label. Download the SkinMan Templates and open them in SkinMan. Design, hide, add or remove elements to your liking. When you´re finished, export the image via the File menu and print it out. I recommend to use good quality photo paper. Use DIN A4 (210 x 297 mm) as print size. Make sure to use borderless print setting, or the control cutouts will not fit! Cut out the cutouts (hence the name, right…) with a sharp cutter. For long term protection, laminate the overlay. Cut out the lamination foil again and you are done. You may want to download one of the BCR sets below and use the contained overlay as an example. This entry was posted in Behringer BCR2000, Gear on 2013/03/02 by MacroDX. The BCR2000 SysEx capabilities are hardly covered by the official documentations and tools. I guess nowadays such controllers are mostly intended for use with software, to control DAWs and plugins. 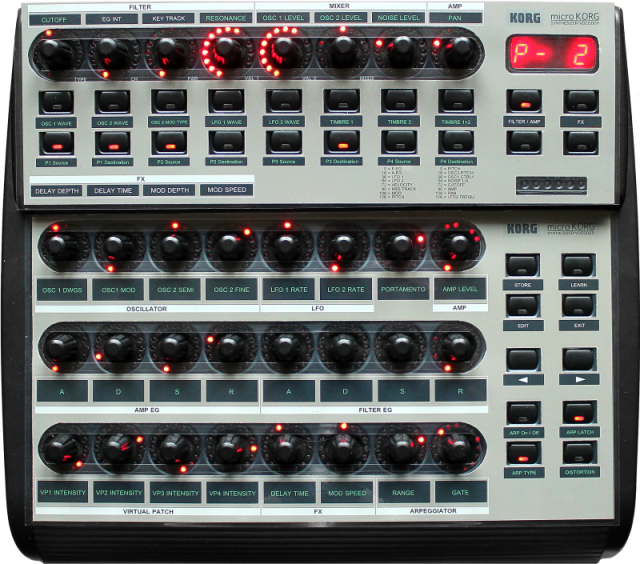 But they are equally ideal to control those 80’s to 90’s digital synths, which lack hardware controls but provide parameter setting via SysEx messages. The BCR2000 is perfectly capable of that, but you have to know how to set it up. You can always use the learn function to assign a SysEx message to a control. If the SysEx message is simple, the BCR will perfectly recognize it. For proper setup however there is a perfect tool out there called BC Manager. It needs a while to get used to the interface, but you can edit and control every aspect of the device with it, send and receive data and manage multiple devices. A must-have for every BCR owner! If you want more information on the SysEx capabilities of the BCR, check out the resources and links on the Mountain Utilities BCR/BCF page, too. I successfully got my device working again by replacing the two 100uF electrolytics. The original ones where causing ripples on the supply voltage which lead to instable USB signals. This entry was posted in Behringer BCR2000, Gear and tagged BCR2000 on 2019/01/30 by MacroDX. When I recalibrated my Poly-61 I had two voices significantly out of tune. Now since all oscillators are digitally controlled and therefore supposed to be in tune, KORG omitted attenuators for individual voices. 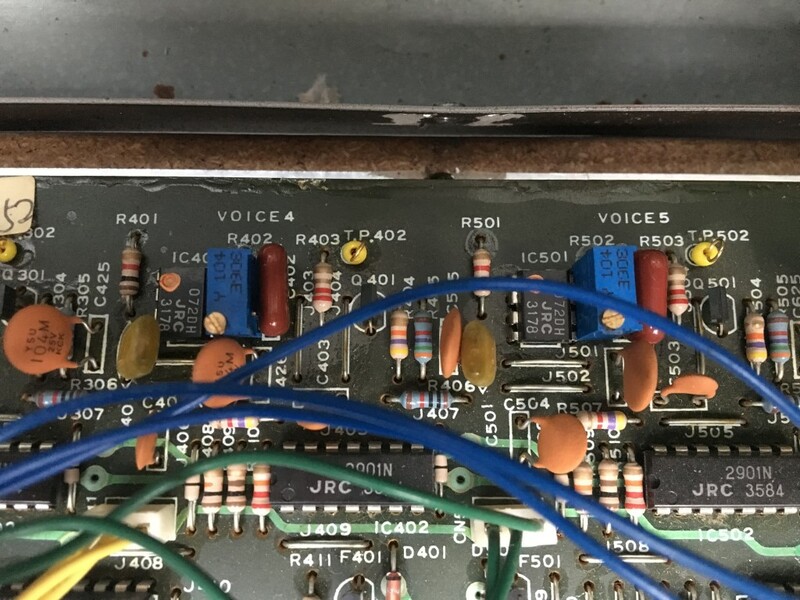 Here´s what I found as probable cause and fix: The parts most likely affected by the aging process in the area of voice CV appear to be the Cn02 (n=1..6) capacitors. I could not identify their exact type, but the marking sais they are 10nF with only 1% tolerance, so precision circuitry could be assumed. If I read the schematics correctly then together with the Rn02 resistors they form the input of the antilog. So there are two possible fixes. The first being to replace the capacitors with new high precision 10nF caps. The other fix is what I went for, firstly because I did not have the appropriate capacitors at hand and secondly because I felt that having control over the tuning would be handy. So I replaced R402 and R502 with precision trimpots. Since Rn02 are 15k the best trimpot value would be 20k. I only had 100k at hand so it was a little fiddely to set the right value but it works for now. I still have to get a couple of replacement parts for proper fixes anyway so I will eventually replace all Cn02 with new ones and all Rn02 with 20k trimpots. This entry was posted in Poly-61, Synthesizer on 2017/12/05 by MacroDX. 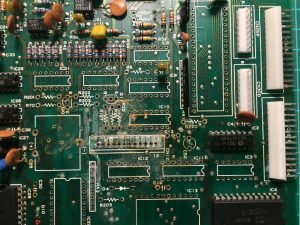 Like some other 80´s polysynths with memory, many of today´s Poly-61s suffer from battery leakage. The problem for most owners without knowledge of the technicalities is that the symptoms come on slowly and do not neccessarily hint at memory. While leaking, the battery may still provide enough power to retain memory while starting to damage the PCB area around it. The device starts acting weird up to doing nothing at all soundwise. The symptoms depend a little on how the synth has been stored and therefore how the acid flowes across the board. If you see a Poly-61 on the used market described as ‘functional’ but ‘holding a steady tone’ it´s most likely a battery dammage. I purchaised such a unit with the risk of not knowing the exact amount of dammage it had taken. But I was determined to make it fully operable again. After all I thought it couldn´t be worse than the Opera-6 fix. If you use the information presented here you are doing this at your own risk. I cannot be held responsible for any damage done to your device or yourself caused by your actions! You need the appropriate skills to do work on electrical devices. There are plenty of download sources for the service manual, but the schematics contained are barely readable. It had to do though. 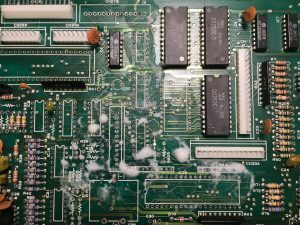 First step was to open up the unit and examine the damage on the CPU board. Interestingly enough the board was missing the battery entirely. The two wire stumps seemed to be the remainders of a first repair attempt. It would not have made sense to look for certain errors before the general dammage on the board wasn´t fixed. So first step was to remove all parts that where affected by the leak. It should be noted that I also removed CN27B and IC2 after the picture was taken. Next was to clean the affected area. First I used 70% Isopropylic Alcohol and applied a big load of baking soda to neutralize the remaining acid. After removing the dried up soda with a tooth brush the damaged area looks alot better. From here we can look for broken traces. With a strong lightsource we can x-ray the board for a visual check. 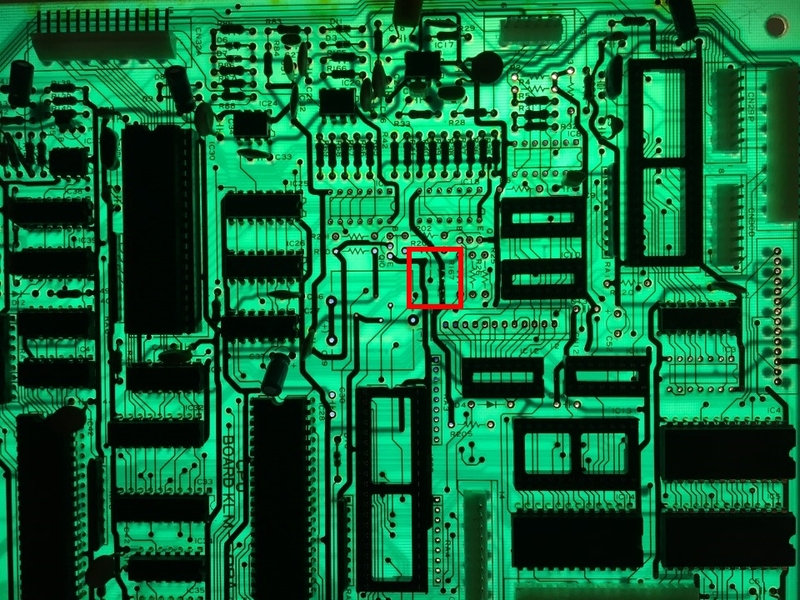 Notice the broken traces in the red marked area. As you can see on the picture already I used sockets instead of soldering the ICs into place directly. 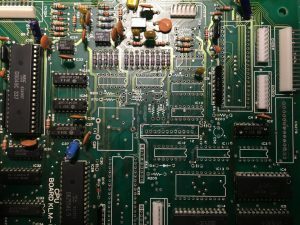 This helps in finding and correcting faults without putting stress on the chips. Sourcing replacement parts was not that hard. Basically all HD14xxx had to be replaced by MOS 40xxx equivalents. 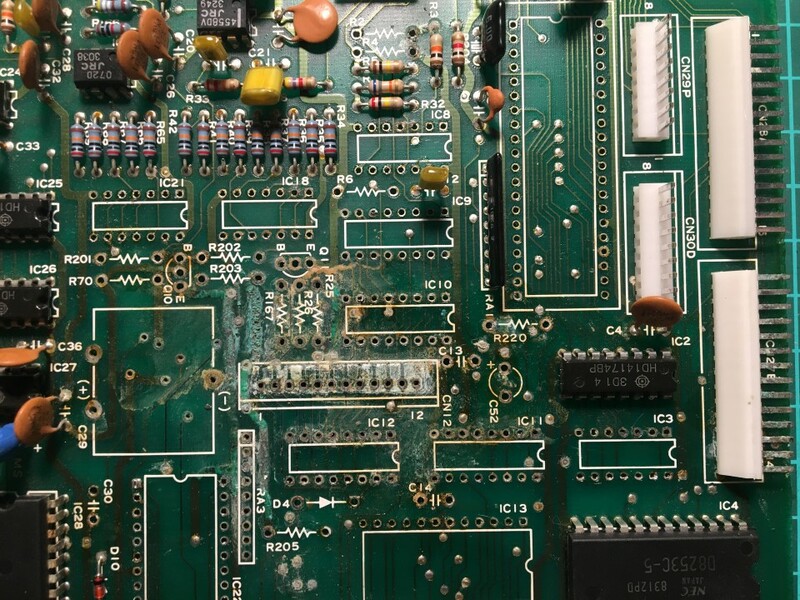 Only one transistor had to be sought out of a variety of possible replacements. I put in a lithium cell insead of the former reloadable type. This requires the load current resistor R70 to be replaced by a diode (1n4148 will do). 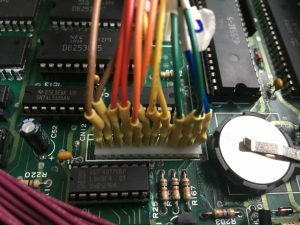 A heads up in advance: Yes, the board connectors can be the source of many problems on the Poly-61. However it depends on the general damage, especially in the case of a leaked battery, whether it is enough to just re-crimp the connectors or whether more action is required. In my case the sockets of CN12 and CN27B where badly affected as well and needed to be cleaned to regain full connectivity. The crimps of the connectors where literally falling apart. 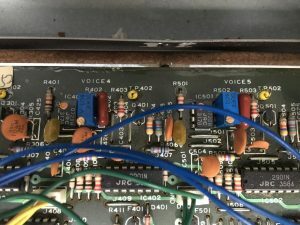 If a synth outputs sound constantly, chances are high that the VCA is open. Now in most cases the VCA is driven by an envelope generator. EGs need some sort of gate or trigger. The Poly-61 uses SSM2056 envelope generator ICs and they have a Gate input at pin 6. 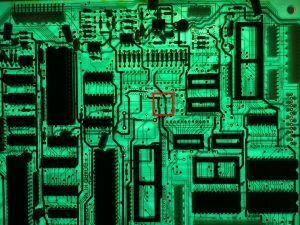 I checked the pins with a DVM and found ~1.3V at five of the six. Now 1.3V is given in the datasheet as the maximum required threshold voltage for the gate. So all these inputs where active. Looking at the schematics you will eventually find that the gate lines are directly connected to buffer IC outputs on KLM-509 via CN12. With CN12 being severely damaged by the battery acid and having barely any connectivity, the affected gate lines where floating. I assume that this causes the 2056 to pull the inputs high internally for some reason. I cleaned the pins of the board connector with a dremel brush and for the lack of replacement crimps came up with a temporary solution until I manage to source the right crimps. DCO2 for the six voices are provided by IC5 and IC14 on KLM-509. DCO2 was missing on voices 4-6. This meant that one of the chips was doing its job and the other one wasn´t. It turned out that a trace between IC11 and IC14 was cracked, leaving the CS line non-functional. 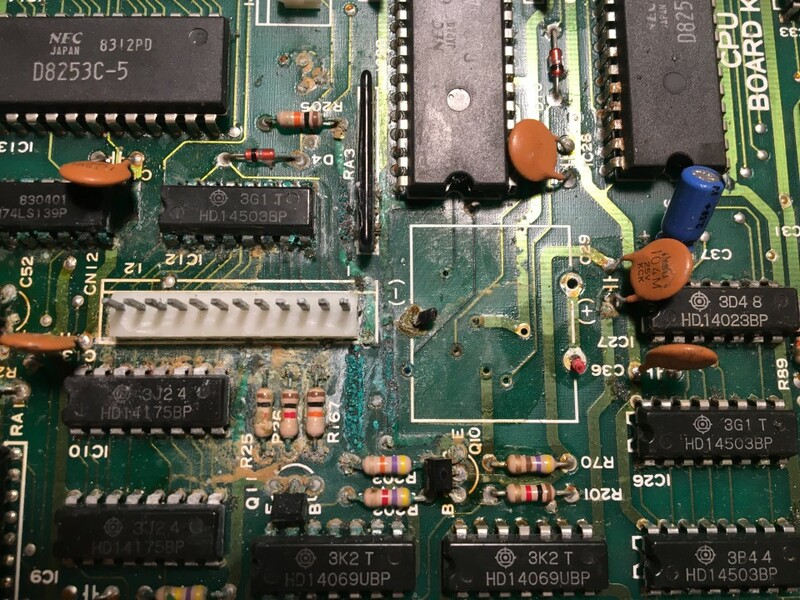 This was in fact an easy fix, because it was also only a cracked trace on KLM-509, but it was the hardest to find out because of the barely readable schematics. In the end I was lucky that I didn´t depend on it more. That was about it. One Poly-61 back to life. All that was left where the typical restauration tasks like cleaning pots and key contacts and cosmetics. 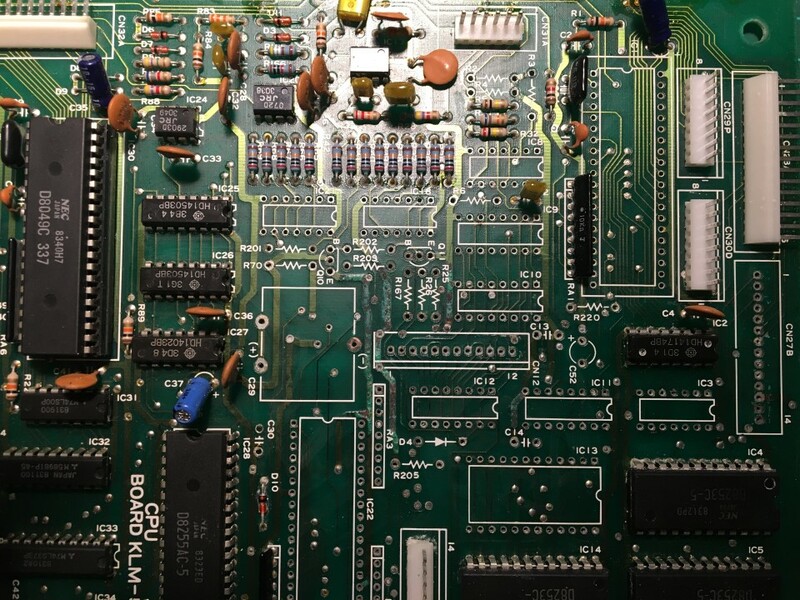 This entry was posted in Poly-61, Synthesizer and tagged Korg, Poly-61, repair on 2017/12/05 by MacroDX. This entry was posted in Behringer BCR2000 and tagged BCRPack on 2016/06/28 by MacroDX. This entry was posted in Behringer BCR2000 and tagged BCRPack on 2016/06/24 by MacroDX.